A wonderful stew perfectly suited for the cold winter months. A stew, in the cold winter months is such a nourishing family meal. The beauty behind it is that you can pop it on top of the cooker or in the oven and just forget about it for an hour or two and it will happily cook away. I have chosen to add some dumplings as they are a favourite of mine but you can just as easily leave them out. Happy cooking!! In a large saucepan heat a little oil. Add the stewing beef, having cut it into small dice and fry quickly until coloured or sealed all over. Prepare the vegetables (Carrots, celery, parsnip, onion, turnip) and cut them all into bite size dice similar to the beef. Add the vegetables into the sealed beef and mix them well around and cook for 3-4 minutes until all the vegetables are sealed and glazed as well as the beef. Next mix in the tomato puree and sprinkle the 30g flour on top of the mixture. Mix in the flour (this will act as a thickening agent) ensuring that all the vegetables and meat are covered and coated lightly. Pour in the stock and mix it well to ensure that there are no lumps of flour stuck in the sides of the saucepan. Allow this mixture to come to the boil and then reduce the heat to a gentle simmer and cook or 1 ½ -2 hours until the meat and vegetables are tender and the sauce is a nice consistency. About ½ hour before the stew is ready you need to drop in the dumplings. These cook in the stew and take about 25-30minutes. If you wish you can finish the stew off in the oven by transferring it to a casserole dish with a lid and placing in a moderate oven. Mix the flour, salt, finely diced onion and fresh parsley together. Mix well. Gently stir in the soured milk, do not add all the milk at once because it may not take all of the liquid. The mixture should be similar to a soft dough (like a scone). 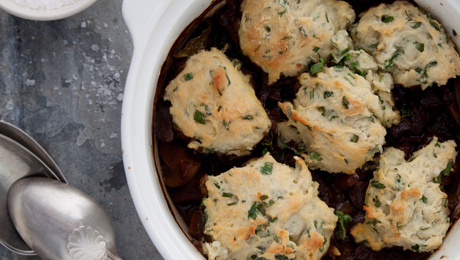 Knead the dough very gently, just until it comes together and then cut out the dumplings using a cup or a scone cutter. They should be no thicker that ¾ inch.